It's not often that a major company devotes a concerted marketing effort towards the niche of jailbroken iPhones. But Toyota did just that. 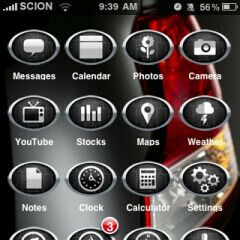 Through their marketing agency, Velti, Toyota placed a SCION-branded iOS theme on Cydia. While it might not seem like a big deal, Toyota's off-market iOS theme represents an acknowledgment of the jailbreaking community, as well as implicit support for the circumvention of Apple's App Store. Upon learning of the theme on Cydia, Apple contacted Toyota, urging them to take it down. Toyota then contacted Velti, which had uploaded the theme, and they promptly removed it. A Velti representative explained that Toyota agreed to take the theme down to "maintain their good relationship with Apple". And therein lies the question: as the jailbreaking community grows, will companies like Toyota become more willing to step on Apple's toes? After all, jailbreaking is perfectly legal. But, even for a company in a different sector, like Toyota, you don't want to be on Apple's bad side. And in the end, it was Toyota that opens the gates of hell for Apple. Now companies that hate Apple are going to unite and make jail broken iOS ads. As long as people are buying their cars what do they care? Apple is a fearless company. They are not afraid to fight for what they believe in and stand for. That's just how Apple is. Other companies do not appreciate it either when their customers mess up their products. Believe me, they don't. But they are just more forgiving and lenient and tolerant. Maybe they're afraid that they might lose their customers. Not Apple. They know that they make excellent products that are highly desirable, and they feel entitled to uphold and impose their standards and for their customers to keep it. With Apple's tight integration of services and their ecosystem, they feel that it is imperative, and indeed it is, that their devices shouldn't be tampered with illegitimately, and I totally agree. Why does google recently slowly putting up restrictions? Because too much openness, is giving them a lot of headaches, and it compromises the quality of their services. But hey, you win some, you lose some. Balance is the key, and Apple just knows how to keep things in almost perfect harmony. Android's open approach worked well in the beginning, but now it's becoming a major mess. ^ Well, now I don't have to comment, because the guy above me took the words out of my mouth.